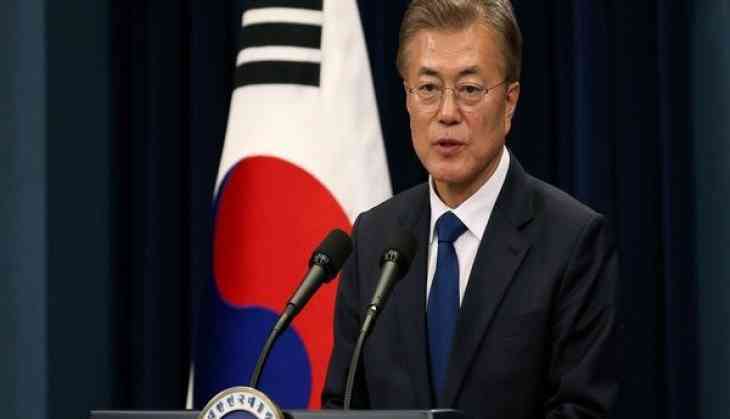 South Korean President Moon Jae on Monday reached Washington to prevent the plan of the US-North Korea summit from falling apart. President Moon is scheduled to meet with the United States President Donald Trumptoday, CNN reported. Earlier this month, North Korea threatened to withdraw from the Trump talks if the US continued to insist Pyongyang abandon its nuclear program. However, the South Korean President hopes to keep the summit on track. Ahead of meeting between N Korea supreme leader Kim Jong-un and the U.S. President in Singapore next month, North Korea vowed that it would close its nuclear test site and halt nuclear weapons and missile tests. The steps are being taken to close down the Punggye-ri test site, where North Korea carried out six nuclear tests. The dismantling of the nuclear testing site is to take place somewhere between May 23 and 25. Earlier, President Trump had given an offer to North Korea to adopt denuclearisation and get rewarded with protection.